Drumbago will be playing a Benefit Concert in Neuadd Ogwen- Pictured here in earlier days in Italy with Sophie.A gin festival, a sponsored climb of Snowdon, specially designed Christmas cards and a hair-shaving event are just some of the many fund-raising activities carried out by friends and family of Sophie Williams in the last few months. The money is needed to make adaptations to Sophie’s home to provide wheel-chair access and space for the carers she needs 24 hours a day. The next big event is a concert in Neuadd Ogwen, Bethesda being organised by Sophie’s band Drymbago on the 3rd February. Sophie performed with Drymbago for many years prior to her illness. The band continue to be great friends and get together whenever possible and have entertained staff at Ysbyty Gwynedd, and more recently Sophie’s rehab centre, with impromptu band practice at Sophie’s bedside. 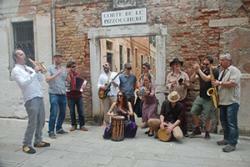 Drymbago are a big band based in Snowdonia who draw inspiration from the music of the Tropics. Heavy, funky and raw with echoes of Colombia, Africa and Guadeloupe; they have a reputation for dance-floor orientated live sets which have seen them perform across Europe and have helped establish them as UK festival favourites. Band mate Holly Gone says “We will have a great night performing and dancing, and at the same time raise money to help our dear friend come home to the place she loves”. 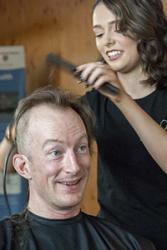 Ronan Roche of the School of Ocean Sciences mid head-shave.Sophie’s close friend Jenny Whitmore, who works in the School of Ocean Science, persuaded colleague Ronan Roche to shave their heads publically at work. With the help of two stylists from ‘The Salon’ in Menai Bridge, the hair-shaving was carried out during the coffee break on Friday morning and raised £350. After 10 months rehabilitation in Priory Highbanks hospital, a specialist rehabilitation centre north of Manchester, Sophie will make the 1st step of her journey home when she relocates to a nursing home in Denbigh at the end of this month. Sophie is very excited about the move which will make it easier for her to connect with her many friends in the Bangor area. The real focus, of course, is on getting back to the home she shared with partner Robert before she fell ill. “It will mean so much to both Sophie and I for her to be able to come home. We live in such a beautiful place with amazing views. She has been able to visit just once since becoming ill but she is determined to move back as soon as we can make the necessary adaptations” says her partner Robert. The gig is at Neuadd Ogwen on the 3rd February. Tickets are £10 in advance or £12 on the door.